This can only be achieved using real eggs! If you are lucky enough to be able to get your hands on free range eggs or even luckier to have a few of the feathery lovelies kicking about round your back garden then make use of them. Eggs from a happy chicken are far superior to anything that a poor ‘prisioner cell block H’ can muster. This is a scrambled egg recipe. It’s possibly the easiest thing you can do with an egg but if it’s done right then there’s no way you’ll go back to the Supermarket for your eggs. Crack the eggs into a deep bowl, glug in some cream – about 2 tbs spoons. Sprinkle some parsley and beat together with a fork. You want to get as much air into this as you can at this stage to ensure you have light and fluffy eggs so whip up and lift the mixture as you whisk. You want bubbles!! Get a good non stick pan on a medium heat, knob of butter and some oil. Put your hand over the pan if it’s warm then sling in the egg – you don’t want this bangin’ hot. When the egg has gone in leave it alone for a bout 20seconds, then with a wooden spoon just gently mix it about the pan, don’t break it up to much as you want the consistency of an omelet rather than baby food. How long you cook this for is up to you, I prefer it quite wet so leave it as long as you need. When it has gotten to the stage you want then season it with Salt and Pepper (adding salt at the whisking stage makes the egg turn a grey colour). 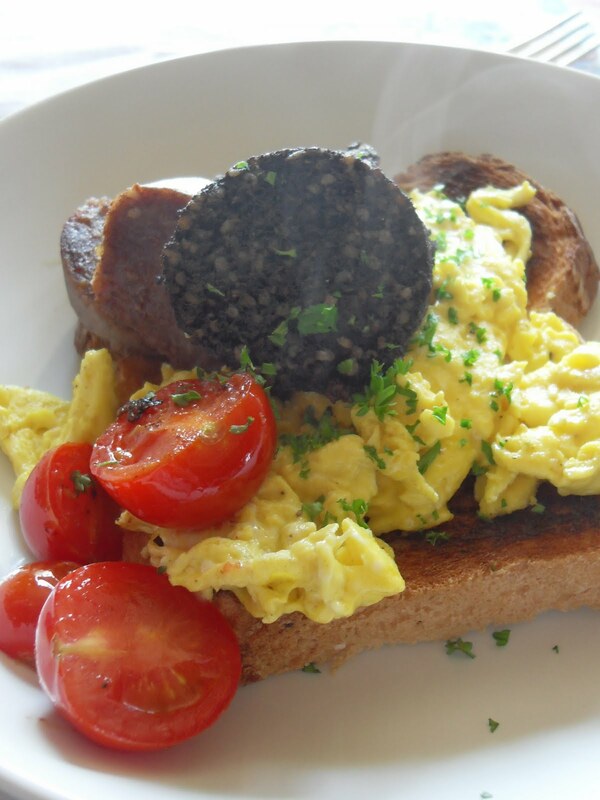 Turn the egg out onto hot buttered toast (a big doorstep) and serve with black and white pudding – and maybe some fried tomatoes. You to 🙂 Hope Stockholm is good this weekend!